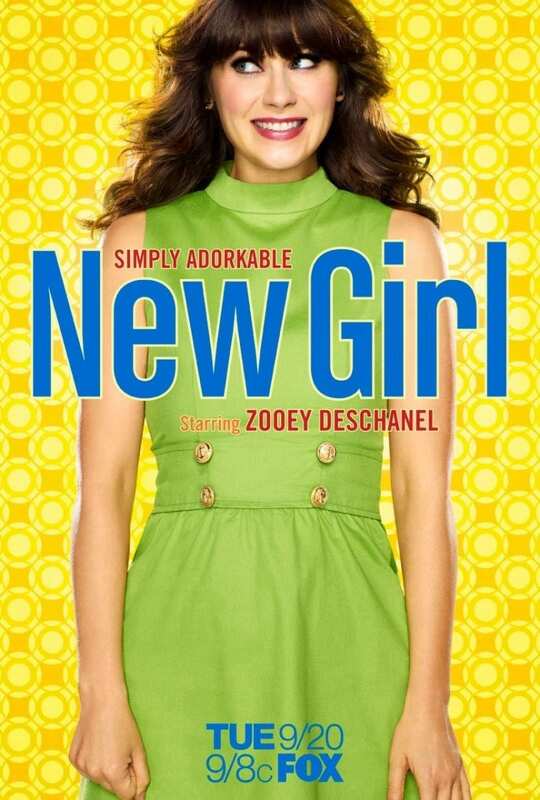 From billboards to buses, you can’t avoid Zooey Deschanel’s pretty face staring at you with 10 foot wide eyes. The show starts tonight at half 8 I believe, but has been airing for a few weeks on the 4OD that’s on your computer but not any of the ones on your iPhone, iPad, Virgin on demand, PS3 or any of the ways you would normally choose to watch something on 4OD. The first episode opens on Jess, saying how when you’re watching a horror movie, you’re shouting at the screen because it’s so obvious what’s going to happen. Flashback to a week or so previous, where she’s in a cab, wearing hipster glasses and a mac, and whispering into her phone not very well. She’s talking to her best friend, who, of course, wouldn’t be an average looking girl but a model. Jess is saying how she is off to surprise her boyfriend and model friend says something like how that’s a great idea. Obviously, this is the shouting-at-the-screen part. You know it’s all going to fail horribly. So Jess goes into her boyfriends apartment, he comes out of his bedroom in a skeevy pair of pants, and she drops the coat and starts doing a dance and singing about how she’s going to make lurve to a plant. (I feel like I’m mixing this bit up with Chef from South Park’s songs). Of course, the girl her boyfriend is obviously cheating on her with comes out and asks what’s going on. Cut back to the present day, where we see Jess is chatting to some blokes who are looking for someone to move in. After a bit of “wah I don’t want a GIIIIIIRL to live with us”, she moves in and sits on the sofa watching Dirty Dancing 500 times and crying because of her breakup. So far I have put up with her random little singing, her overdone hipster look and the fact that Deputy Leo is in this (I was always more of a Logan fan) but this? I instantly started to dislike it. Its a show that feels like its trying too hard to hit all the points of other successful sitcoms. “Move a girl in with a load of blokes!” “The blokes should be varying stereotypes – the player, the sadsack and the angry black man (who is then replaced by the second episode)” “She should wear those glasses all the kids are wearing!” “She should be photographed for all the promos with her arms in the air because SHES THAT CRAZY!”. I’ve been told that the series does get better, but I couldn’t even make it through the first episode on a second watching. Doesn’t bode well. Man I was really worried about watching this after I’d read this post because everyone else I knew seemed to saying that they’d liked it. Finally got around to watching it and had my jaw clenched waiting for the disappointment but I’m afraid it didn’t arrive, I loved it! We can still be friends though yeah? The next episode was a fair bit better. They’d made some changes and reintroduced the story so you don’t really need the pilot. I still don’t think it’s brilliant but I do think it’s worth a second chance, unless you completely 100% hated it.